Like the rest of the brethren of this Lodge I was reared on the staple diet of the Authorised Version of the Bible, better known as the King James Version. The story behind that Version is the subject of my lecture. It is an enormous story, but I will try to keep it brief. 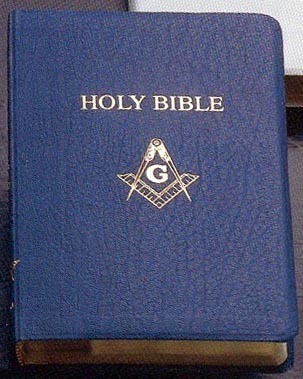 I add that the King James Version is the common Bible used as the Volume of the Sacred Law in the Temple in all the Masonic Orders that I have been a member of, and the one at which we take all our Masonic oaths. There is room in Masonic law to use different sacred books, eg (if the majority of the brethren are Islamic) if a Brother of the Lodge or a visitor is of the Islamic Faith, the Koran will also be open on the pedestal, and if Jewish then the first part of the Bible or the Old Testament. The rule is simple - the sacred book on which we seal our oaths must be sacred to the particular Brother, and remember no atheists can become freemasons. Question – have you ever notice a biblical quotation in Shakespeare, gone to look it up in the Bible and found that it is different ? Or read part of the New Testament quoting from the Old Testament, and noticed that the quotes were different. How does one explain that ? The simple answer is they were using different versions of the Bible – eg Shakespeare was using the Geneva Bible not the King James Version that we know. The speech of Stephen in the Acts of the Apostles is from a variant Old Testament tradition. So too with Jesus’ quotes from the Old Testament All were using different Versions. So the question for this lecture is – what is the King James Version and why is it used in our Temples ? I can easily answer the first question but the second question seeks further discourse. It is said that the two greatest influences shaping the English language are the works of William Shakespeare and the English translation of the Bible that was published in 1611. The King James Version is named after the monarch who ordered a new translation in 1604. It was a book that helped shape English literary nationalism, by asserting the supremacy of the English language as a means of conveying religious truth. Throughout the 16th and 17th Centuries the Bible was seen, not as a text to inspire one to devotions, but more as a social, economic and political text. Thirty years ago when I was doing my Ph D research I noticed the concern in the 1615 Regal Visitations to the Dioceses in Ireland, as to whether a biblical text was used as the start of a sermon. These doors were opened by the new technology of printing which had a devastating effect on mankind, much the same as computers and the Internet have had on us in the last twenty years, especially the Internet and its mailing system the e-mail. In 1620 the English philosopher Francis Bacon noted how three interventions had reshaped the world – gunpowder which changed warfare, the magnet which facilitated the ship’s compass allowing navigation when the sun and stars were not seen; and the invention of printing. As the end of the mediaeval period a social revolution took place – the rise of the new middle class., so that now you need not be a landed squire or peasant. Literacy had often been confined to the clergy and it was they who handled all correspondence and archives – hence the term still used today in office jobs “giving clerical assistance”. Lay people were beginning to learn to read and write, and the possession of books was now seen as a social virtue. But till now all books were copied by hand – a tradition that is still carried out in the Jewish synagogues when the VSL has been hand copied, fortunately only the first five books of the Bible, and the expected price is about $30,000. The more people who could read the more the demand for books, so a new technology was needed. The breakthrough came with Johannes Gutenberg who invented the moveable metal type. Printing the Bible was an obvious first but not a profitable as printing indulgences, a watershed of the Reformation. England’s first printer was William Caxton (1422-91) who had learnt his trade in Bruges and in 1476 returned to England to set up his own shop in Westminster. His first job was printing indulgences – by buying one of these printed documents for an exorbitant sum of money one could get the same spiritual benefits as one got from a pilgrimage to the Holy Land without the hassle of having to travel. Needless to say, the profits from indulgences were shared by the printer and the Church. Though no figure exists for Caxton’s sales, it is said that Gutenberg sold over 200,000 indulgences. Before going on to the Bible, a few words about the English language. One of the reasons for the slowness of an English Version of Scripture was the merits or supposed lack of merits of the English language. French and Latin were the dominant languages in 14th Century England, and English was the language of peasants. But later it was the translation of the Bible that helped English to become refined as too the works of William Shakespeare. In 1408 the translation of the Bible into English was made illegal by the ‘Constitutions of Oxford’. The defeat of the French at Agincourt mirrored a cultural defeat of the French language in England. Another formative influence in using English as language of religion came from the performance of mystery plays in Chester and York around the feast of Corpus Christi. While the Church fed the faithful with the Mass Bible and Sermons all in Latin, the plays offered religious teaching in the vernacular plain English. The ‘Englishing’ of the religion was opposed by the church, so it became the language of the religious underground. One of the themes of the Reformation was the translation of the Bible into the vernacular. In addition to being a religious movement, it embraced and encouraged massive social, political and economic change, just as the Renaissance give rise to individualism. People started to think of themselves as individuals and this led to a demand for a Christianity that was relevant to their personal experience and private worlds. The laity had come of age, and the future belonged to them. Lay access to the Bible was as much about power as encouraging personal spirituality, with salvation seen as a gift not earned as a reward. Just as Henry VIII displaced the Pope as head of the Church in England, so Latin was replaced by the English language . William Tyndale (1494-1536) is widely regarded as the most formative prior to the King James Version. Educated at Hertford College Oxford, the first edition of hid New Testament was published in Worms in 1526. The work contributed to the English language such phrases as ‘the powers that be’ or ‘my brother’s keeper’ ‘the salt of the earth’ ‘a law unto themselves’ – all were phrases that were well shaped in terms of alliteration, rhyme, and word repetition. He also invented words eg ‘Jehovah’ ‘Passover’ for the Hebrew Pesah, neologisms like ‘scapegoat’ ‘atonement’, ‘reconciliation’ etc. Note it was for the Bible that these phrases and words were invented, a pattern which was followed in the King James Version and also explaining why the Bible had such a great influence on the English language. Tyndale had two achievements – producing an excellent New Testament, and forcing the English Church into seeking to have an officially recognised English Bible. Alas Tyndale was to fall from favour, being arrested in 1535, and strangled the following October, his dead body burned at the stake – biblical work at that time was not just a scholarly activity but illegal, dangerous and ultimately fatal as Tyndale discovered. The first complete English Bible was published in 1535 – that of Miles Coverdale based on the work of others including Tyndale, and it was more an amalgam of existing works. Its uniqueness was that it was the first English bible and so paved the way for the King James Version. Other English Bibles were published – eg the Great Bible of 1539, the Geneva Bible in 1560 from John Calvin, the Bishops Bible of 1558 to name just a few. Note that it was only in this stage of the history of the Bible that chapter and verse arrangements were introduced in the Bible by the Frenchman Robert Estienne as an aide for using the whole bible in public worship, as opposed to a Book of Readings known as a Lectionary which contained only the sections required to be read in Church. If a new Bible caught on, fortunes were to be made. It was the Geneva Bible that was most popular, by providing explanatory notes in the margin. But it was these very notes that caused the problems. They were disliked by the Establishment as tending to Protestantism, if not straight out Puritanism. Without going into the details of Queen Elizabeth I’s reign it is to be noted that alongside the economic growth, military successes, and increasing sense of national identity, a new confidence in the English language began to emerge. The Geneva Bible was am import. The lines of the latter battles were to be drawn along the divide of Puritan versus Anglican, with the new King James 1 proclaiming ‘no bishops no king’, which summarised his view of the interrelationship between church and state. James had come from Scotland, and was a direct descendant of Henry VIIII’s father Henry VII. James believed that Presbyterianism was linked with egalitarianism and republicanism, and was anti monarchy. When James read his Bible which was often as he regarded himself as a theologian, he began to intensely dislike the Bible that was available – the Geneva Bible, the major problem being on the marginal notes relating to the Divine Right of Kings, which he defended from Ps 105:15 about the anointing of kings at coronation. The Geneva Bible undermined whatever biblical basis there was for the divine right of kings, a position that he regarded as pivotal as too did his son Charles I, leading to the English Civil War. James now had a personal agenda – to rid England of the Geneva Bible and its detestable marginal notes – so this turbulent Bible had to be buried. On his way down from Scotland in 1603, James was meet by a Puritan delegation and presented with a Millenary Petition so called as it had been signed by over 1000 ministers of the Church of England seeking relief from some aspects of the Catholic side of Elizabethan Anglicanism. On 24 October 1603 James issued a proclamation that he was convening a conference to be attended by himself, members of the Privy Council, various bishops and other learned men, to be held at Hampton Court the following January 1604. It was this Conference that was the birthplace of the King James Version, opening on 14 January 1604. Many issues were discussed that are not directly relevant to this lecture, but most important for us is that a new translation of the Bible was authorised. James directed that the “best learned” in the Universities of Oxford and Cambridge should start immediately. James went on to publish a treatise against smoking leaving the Bible to others. Despite being the pillar behind the most notable English translation ever, as time passed James came more obviously homosexual, his favourite being Robert Carr some twenty years younger and made Earl of Somerset in 1615. I think few of those who believe that the King James Version was the word of God, was engineered by a homosexual. The translators appointed for the task were not to be paid for their work, and the “four and fifty” men selected were told that they could expect potential preferment in their careers – Archbishop Bancroft as Archbishop of Canterbury writing to his fellow bishops seeking appointments for the translators, with 20 pounds a year proposed as their stipend. Fifteen translation rules were formulated, including one which directed them to base their new work on earlier Versions – or as was thought in the parlance of the day “they were to stand on the shoulders of giants” in using the work of previous biblicists in making good translations better. After all the Renaissance approach to wisdom was that one generation is nourished and sustained by the intellectual achievements of its predecessors. The translators were divided into six companies of scholars, and the Bible was divided up amongst those companies. There is very little documentary evidence to give us a picture of the working life of a translator, except for the biographical sketch from John Boys, working in his parish on Sundays and returning to Cambridge for the remainder of the week to be engaged on his translation duties. The most remarkable thing about Boys’ biographical details is that a corrected copy was discovered in the library of Corpus Christi College Oxford – in 1966 ! The translators then got together at the Stationers’ Hall in London. Careful consideration was given by them on how the translation could be understood by those to whom it was read rather than those who read it. There were difficulties in understanding what rare Hebrew words meant, so marginal notes were inserted giving alternative translations, but they did use the standard orthography of the period. Eventually the whole lot was delivered to the King’s Printer Robert Baker. The printing of the King James Version was a massive undertaking, not only because of the length of the Bible, but also because of the number of copies required – one for every Church in England. It is noted that it was a work of private enterprise – the King might well have authorised it but certainly not pay for it, and instead it was done by venture capitalism estimated to be about three and half thousand pounds. The customary title of “Authorised Version” when talking about the King James Version has always attracted interest. It was thought that the phrase “appointed to be read in churches” implied that it was authorised for that purpose. But the words simply mean that the work was laid out in such a way suitable for public reading. Strangely there is no evidence that this version of the Bible ever received final authorization from the bishops, the Privy Council, or the King. The King James Version was primarily book for use in public worship and not private study. It was also very large and heavy, and could be read easily at a distance. The translators of the King James Version faced the same problems as other translators do – how to render a text written in one language and then place it in another. This difficulty is best phrased in the Italian expression “the translator is a traitor”. In particular, the original language of the Old Testament is Hebrew which is a complex language – only 22 letters and vowels spoken not written. Too often we come to the Hebrew text (known as the Massoretic Text, ie the received text) already knowing the meaning by familiarity of an English Version. Also a few portions are in another language – Aramaic which was the international language of diplomacy in the Ancient Near East. Regardless, Biblical Hebrew is full of idioms, and has many shortcomings in modern terms. As an eg it is to be noted that Hebrew has very few adjectives, eg to say ‘my golden cup’ in Hebrew is ‘my cup of gold’. When this comes to theology there arises absurd results, eg the favourite in the King James Version of ‘the children of Israel’ is literally ‘the sons of Israel’, ie Israelites, just a Mac means ‘son of ‘ so ‘Mac Israelites”. Unfortunately knowledge of Hebrew in 1611 was rudimentary, with little or no knowledge of cognate languages like Akkadian and Ugaritic. Before concluding I would note that while the English of the King James Version was probably already archaic in 1611, the Bible had the unintended effect of turning their antiquated English into perpetuity. Eg the use of ‘thee’ and ‘thou’ and different verb endings like ‘sayeth’ were already passing from speech in 1611. The translators use of somewhat archaic language is to be traced back to their instructions to use previous Versions where possible eg the Bishops’ Bible of 1588. This created the impression that religious language was necessarily archaic. Similarly the use of ‘his’ and ‘its’- Middle English did not know ‘its’ as meaning ‘belonging to it’, and in its place was ‘his’, as Middle English used it. The translators retained the older use of ‘his’ as the neuter possessive pronoun. Contrary to all the modern objections to exclusive language, the problem did not relate to gender, just as our every day usage. The King James Version sought to solve the problem where possible, and came up with a solution – the use of the cleverly crafted word ‘thereof’, eg “its width was five feet’ became ‘the width thereof was five feet’. For those who say that the language of the King James Version was exclusive, implies a misunderstanding of 1611 English. The English Civil War included the battle of the two great bibles – the Geneva Bible and the King James Version. When the monarchy was restored in 1660, a new Prayer Book was evolved and the King James Version was placed alongside it, both implying religious conformity and security. No wanted to return to the chaos of Puritan England – just as Germany disowned its Nazi past after World War II. Its origins were to take out the controversy of certain religious thinking, and it probably lasted till the beginning of the Twentieth Century. In 1979-82 a New King James Version was produced, based on the traditional texts including “its quality of translation and majesty of style”. Let me conclude by stating that linguistic development is simply a sign of life into a language is being used and adapted to new situations. Whatever, the King James Version still retains its place as a land mark for popular Christianity, and still speaks to us today in our Lodge. Thank you, Worshipful Master, and I would happy to attempt to answer any questions.